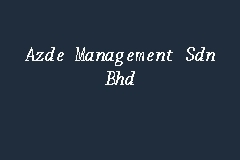 Azde Management Sdn Bhd is located in Kuala Lumpur, Malaysia. Company is working in Consultants business activities. The charge for registering new company (Sdn Bhd) with SSM Malaysia is RM 2800. Retainer fees is RM 75 per month. Start share your experience with Azde Management Sdn Bhd today!